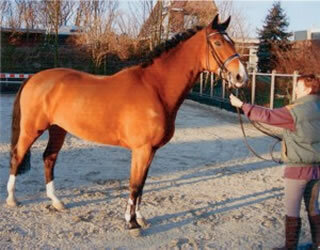 Khenomare - Dutch Warmblood Mare - Legacy Farm Ltd.Legacy Farm Ltd. This multi-talented Dutch mare was bred in the Netherlands. In the Netherlands she was a breed show champion with talent in riding and jumping. Before she was imported to the United States she was awarded the sport predicate for her competition results in dressage. This mare has very interesting bloodlines. The sire, Amethist, has at least two nationally ranked offspring in dressage, Jazzman and Karajan. Jazzman ridden by Donna Richardson and Karajan ridden by Dorie Addy-Crow placed in the top ten of the 2000 USDF Horse of the Year awards for Intermediate I & II. Amethist’s sire is the great Dutch jumper, Nimmerdor, by the Holstein stallion, Farn. 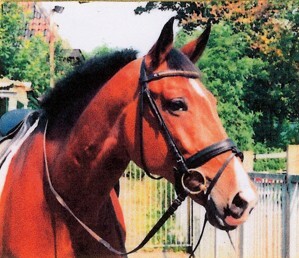 Farn also appears two more times in the dam’s pedigree via the Dutch stallion, Garant. With all of this jumping blood in her background it is not surprising that this mare shows above average talent in jumping. To look at the Acrobat copy of her pedigree, click here.